Stewart Butterfield says it can. A decade ago, Stewart Butterfield and a team of cohorts were building a massive multiplayer online game (MMO) called Game Neverending. But they got sidetracked with a spinoff project–the photo-hosting site Flickr–which Butterfield and his cofounder Caterina Fake, sold to Yahoo in 2005. Now Butterfield and his original team are back with a new MMO–the descendent (in philosophy if not actual design) of the first one. Launching today, it’s called Glitch. And while it’s structured like a conventional online game (there are objects and skills to acquire, and levels to move through), its actual goal is more profound: To create a world where players actually start creating their own games–and thereby get back in touch with the kind of spontaneous, imaginative game-playing that comes naturally to children on playgrounds but that gets lost in adulthood. That might sound idealistic and utopian (and, if you’re an East Coaster, possibly even a little dippy). But Butterfield is confident that the game his team has created will appeal to enough people that it will not just bring in players, but that it will also generate the tens of millions of dollars in revenue needed to give his company’s investors a healthy return on their investments. As with all things transformative (or at least potentially transformative), it’s hard to describe Glitch because it doesn’t immediately correlate to anything that already exists. But here’s a stab. Glitch, like many online games, is set in an imaginary world. 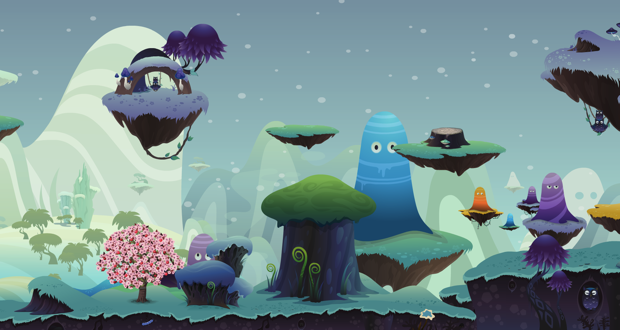 Players create avatars and then use those avatars to wander through the world. There are tasks to perform, and for many of those tasks, you need certain skills and objects, which you have to spend time acquiring. You accumulate points along the way, and after you earn a certain number of points, you can move up to a new level. At the same time, however, Glitch is a world that people can “live” in, the way they lived (or perhaps still live) in Second Life. Players can set up homes and businesses. They can throw parties. They can even tangle with the game’s in-world administrative bureaucracy (where Glitch’s clever designers sometimes have civil servants playing FarmVille on government computers). And once people understand how the world works, they can even start hacking it to advance their own goals or create their own pseudo-games. In that sense, there’s a Burning Man element to Glitch as well. “We provide the raw materials and a stimulating environment, but it’s the players who bring the infinite world alive, shaping it with their imagination,” Butterfield says. But apparently there’s something about it that is connecting with players. About 27,000 people plunged into the game during the beta test, which started in April. And those players played an average of a little more than 21 hours over five months. Unlike many online games, especially those produced by FarmVille parent Zynga, Glitch doesn’t sell virtual goods (like tractors or swords) that let players more forward or move faster through the game. “I think it’s burning people out on a lot of those games,” Butterfield says. Instead, Glitch will make money from selling outfits with which to decorate your avatar. It will also sell subscriptions, which give players access to a wider selection of outfits from which to choose. But the major key to Glitch’s success, Butterfield says, will be to maintain World of Warcraft-style engagement levels (some WoW players have been playing for years). And that will depend on whether the game he’s created, which is about creating a space for other people to make up their own games, will actually resonate with players. It’s that kind of spirit that enabled Burning Man to grow from a gathering of friends on a San Francisco beach to an annual seam-busting, thriving, ever-changing temporary city of 50,000 in the Nevada desert. Glitch will show whether that’s also possible to pull off in an imaginary online world.